Your issue is that you are attempting to use a single business service to represent both the automated and human customer support service. I would recommend creating a human customer support service (realised by the customer support process), and an automated customer support service (realised by the automatable customer support process). 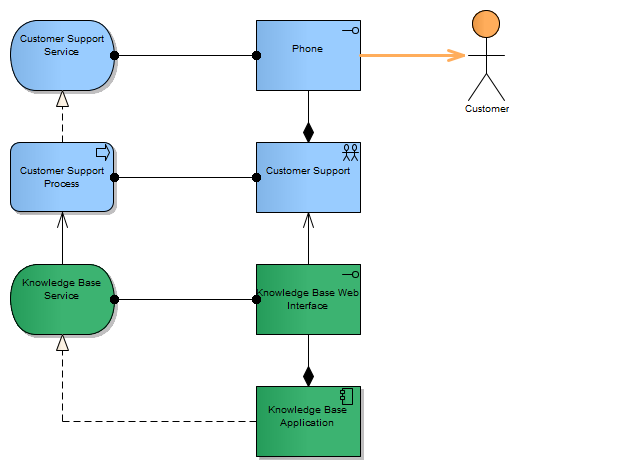 You can then compose (with the composition relationship, and visualised with nesting) the two business services into a single Customer Support business service. The reason you must in fact use two different business services is that different behaviour is observed by the customer at the phone and web interfaces. Thus, different business services must be modelled. First of all, thank you for your time and comment. Based on your comment I assume you agree with my use of the assignment relationship linking application layer active structure to business layer behaviour. I do not know if I fully agree with your suggestion to create two business services. First, a lot of literature uses services like this, take for instance Tom Graves book “Doing Enterprise Architecture” (I warmly suggest Tom’s books by the way, see http://tetradianbooks.com/). Most of them point to the logical/physical relationship between the service and the realizing (active) structure(s) as the advantage: you can manage a whole list of realizations as one, from the point of view of the service. In this light I often hesitate to create a one-to-one relation between interface and service: a new service definition for a new interface or vice versa. I fear that if you create a new service each time the consumer has a different (material) experience, you end up in this one-to-one world. I tend to define services based on the “need” of the consumer and use interfaces to model how the consumer interacts with the actual realization to serve the consumer’s “need”. Indeed. However what if we were to specialise the customer support need to “Simple Customer Support” and “Enhanced Customer Support”? As you stated, the automated option provides only rudimentry answers, and thus is not suitable to the needs of all customers. So in my view there are indeed two business services at play here, each addressing a different (although similar) customer need. Let’s say we have a business process that involves a person taking a piece of paper and folding it in half. Let’s then say we have five people in a line following the same process. Each person takes the piece of paper from the previous person, folds the paper in half and hands it to the next person. In this scenario we actually have three processes because the people at the beginning and end of the line need to follow slightly different steps. So the three people in the middle are following the same process right? So how do we model this? We can’t model three processes with the middle process looping back on itself. We would have lost the fact in the behavioural model that there are five steps to our broader process. This scenario has led us to consider the fact that architecture deals with instances more than it does types. The three processes in the middle are of the same type, but there are three instances of that process running. Thus, we need to model all three of those processes in our model – each of the same type. Unfortunately ArchiMate doesn’t provide a means of us expressing that they are all of the same type. The same is true in building architecture. We may have a building with a number of beams meeting the same specification. We don’t however in our architecture simply have a single representation for the single beam type. We have a representation for each beam in the house. Without this, a builder wouldn’t know how the build the house. If our customer support process is in fact a process instance (rather than a type), then it can only be realised in a single way in the real world. If we were to have the exact same process performed both by a human and by a computer, then we would have two process instances (albeit of the same type). We could however consider a single process instance being jointly executed by a human and a computer. Thus in this case we would have a single implementation for the process, which involved BOTH a human and a computer. So we can see either way that a single process (instance) must have only a single implementation in an architecture model. 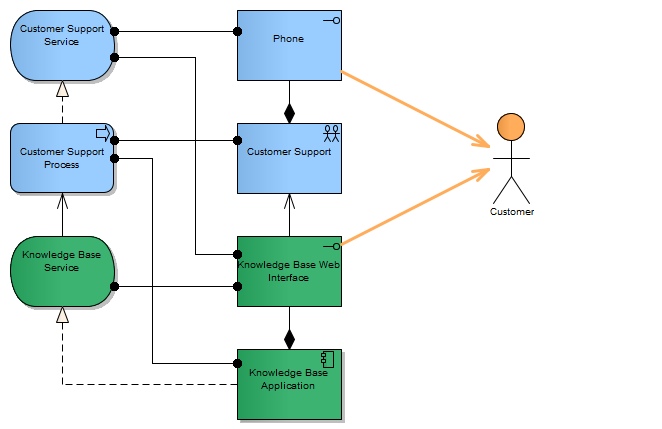 Now, a business service represents the externally visible behaviour of a business process (or business function). Thus, the instancing issue extends also to business services. If we have two different processes realising a single business service, then my view is that this means that both services JOINTLY realise the business service. They dont each independently realise the business service in its entirety. The point you make regarding having multiple possible implementations for a single service is true when considering only types (not instances) because the implementation hasn’t yet been decided. In an architecture however you are laying out the plan for the implementation such that it can be built. The architecture cannot leave open to interpretation which implementation is to be selected. The architecture must specify that selection. 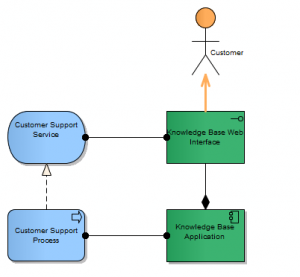 So it is valid to assign multiple interfaces to a single service as long as those interfaces access the same process implementation – that is the implementation that realises the assigned business service. Please don’t take anything I say here as gospel. I’m actually really hoping to open this up to further discussion and am very interested in getting your thoughts on the above. I agree with Bill that it should be 2 different services. Just because you say: “whose questions are just too complicated and require a customer support representative.” which in fact means you deliver 2 different kind of services. The fact that the support person is involved has added value on top of what the application service offers. 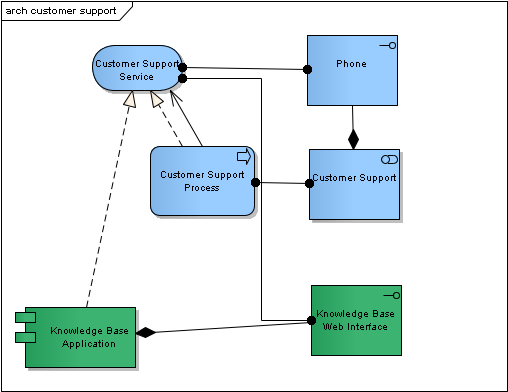 Now suppose the support person does not offer any added value meaning does not ask questions to get more information from the customer, does not give any hints towards a solution, does not do any interpretation of what the customer says in fact he/she just friendly listens to the customers and enters exactly what the customer says into the tool. Then I would model it in a different way (I’ll send you a figure of my model, because I cannot add it here). 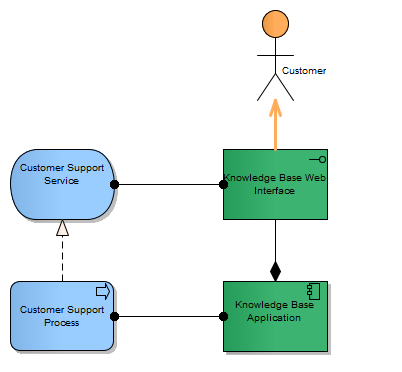 Now you indeed have a loop in there: you have a process realizing a service and that process uses the same service. Which I think is always the case, any process can realize a certain service by just calling on ‘something else’ realizing the same service. 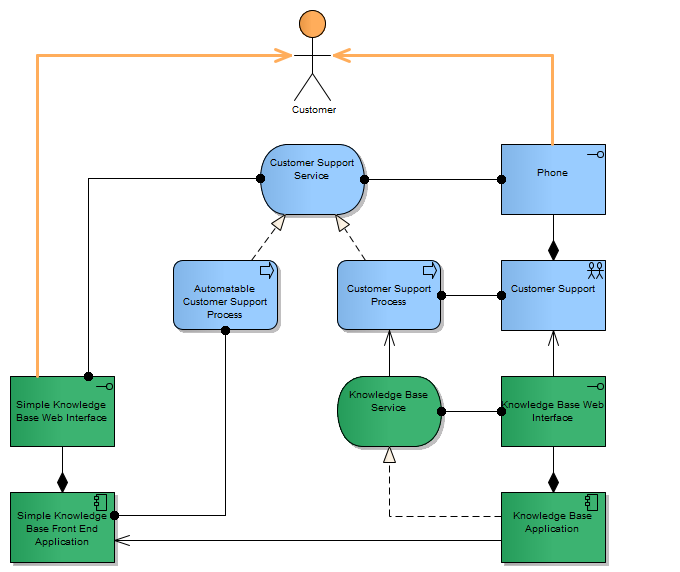 I modeled the used by relation between ‘customer support service’ and ‘customer support process’ for clarity, but I think it can actually be omitted. Thank you both (Bill and Wim) for the insightful comments you made. I updated the original post to make sure people don’t forget to read them as well. These comments have given me much food for thought and I’ll try to make some follow up posts. @Bill: I don’t fully agree with your view. On the example of folding a paper you say: “We can’t model three processes with the middle process looping back on itself. We would have lost the fact in the behavioural model that there are five steps to our broader process.” In fact I would do exactly that. I don’t think an archimate model intents to clarify that kind of detail. That would become clear when you would model the global process of folding a paper 5 times (eg. in BPMN). 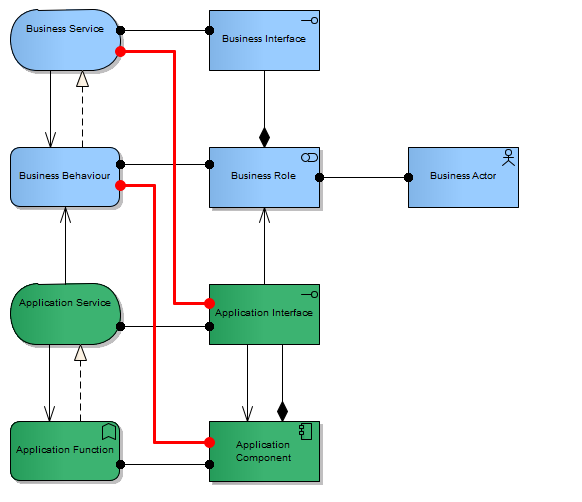 In my view we would never talk about instances in an archimate model, as such I would also say that if 2 processes realize a business service they each independently realize it. I agree that an architecture cannot leave room for interpretation, but I’m sure an architecture would not only consist of an archimate model. Just like you don’t create a design by just creating classdiagrams. 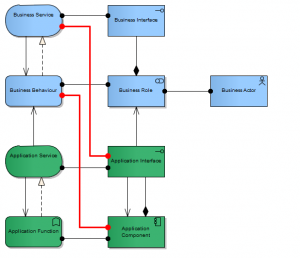 You also need the dynamic behaviour (BPMN, sequence diagrams,…) which you cannot model in Archimate. BTW: I think the ‘triggering’ relation is an attempt to make it possible to model both structural and dynamic behaviour in 1 model, but it clearly is not enough to clarify all implementation choices. Nevertheless, as I mentioned in my previous post, I agree that in the original question there should be 2 services because they are distinct in this case. @wimdrossaert: Let’s say you have five warehouses in a supply chain you need to model. Let’s also say that the processes for receiving and forwarding goods are standardised. Let’s also say we model five Actors – one for each warehouse organisation. In my view, we also need five processes – one triggering the next. It is your assertion however that only a single process should be modelled – looping back on itself. However from a process optimisation standpoint (value stream mapping, etc), it doesn’t speak to what is actually going on in my view. Looking at any one warehouse in the model would give the impression that the warehouse independently performs a process that loops back on itself. If five processes are modelled, the model shows that the five warehouses are related within a chain of processes. If only a single process is modelled, we see five warehouses independently executing the same looping process. Let’s now say each warehouse uses a warehouse management system. Each warehouse has the same system deployed within each warehouse. Each system stores its data independently from the other systems, but the data structure is standardised. There is a file transfer that moves between warehouses to tell the next receiving warehouse about the goods it is receiving from the previous warehouse. 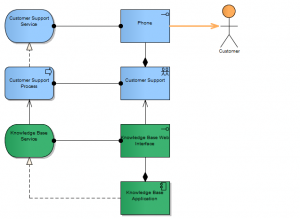 Now, do we model a single application component or five application components? Again, it is my view that we need five application components. In my view, each is a different logical application component. Each stores different data at different times. Each serves different regions. Even though they are all of the same type (i.e. a standardised application), they are different logical application components. Each serves a different purpose in the architecture. If in our architectures we only ever deal with types, then it is unclear as to how the enterprise is to be instantiated (i.e. built). 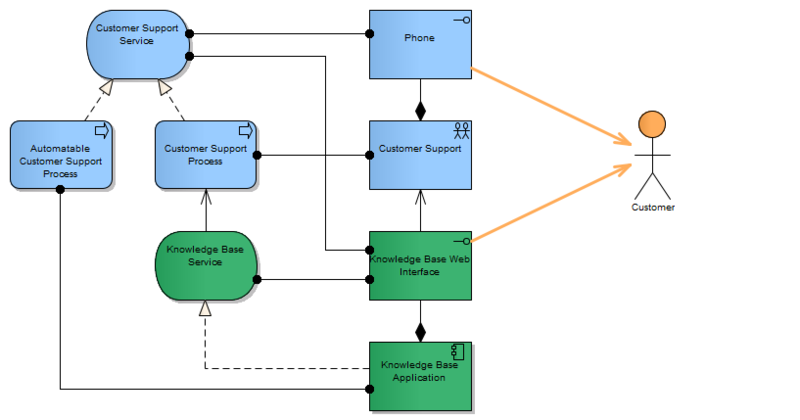 Even UML, we have the Object Diagram which shows how classes are arranged in actual instances and how those instances interact. 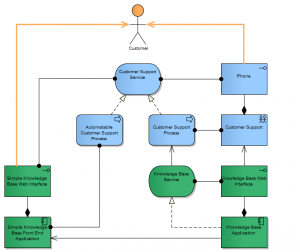 Why do we not need any such construct in ArchiMate?